If you are not tired of my garden in mid-April tour yet, here is the third instalment - the onion family. This season I am making a serious attempt at growing garlic. I have tried growing garlic before, but I am not sure I have ever been focused enough in the past to get a result I was happy with. This year I am trying Monaro Purple which are reputedly suitable for colder climates. I wonder what their origin is - the Monaro Plain of NSW? They look pretty good so far, I am certain every bulb I put in has come up. They are Rocambole-style garlic which are hardnecks. The neighbours up the track had great success with this variety last year and so I am taking their lead. It is of course possible that it was their gardening skills rather than the variety of garlic that made the difference, but for now I am placing faith in the variety and a liberal dash of lime. I love leeks, really love them. I also like how they look in the bed and love their huge round flower heads. These leeks I bought in punnet form, but I have another row in which is much less developed that have been raised from seed. I always put leeks in quite close together, thinning out by pulling some quite young. On the right of the leeks you can see some parsnips on the way. We seem to eat a lot of spring onions so I have a lot in. They are mostly in pots but there are some in the beds. These have all been raised from seed. 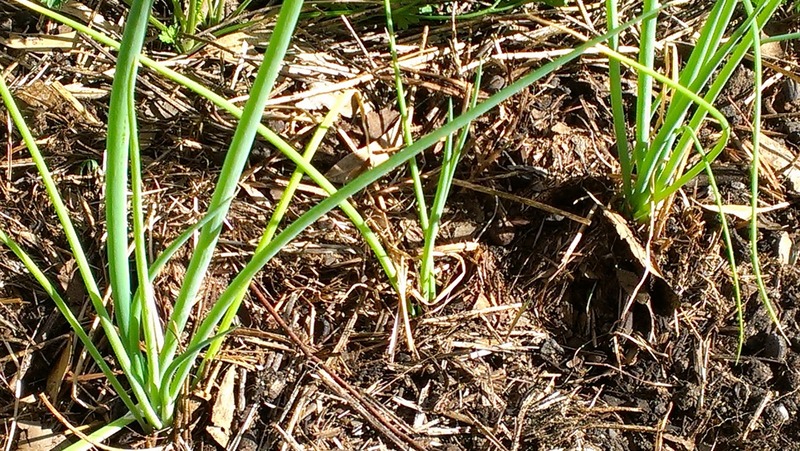 Again, like the leeks, I tend to plant densely. Years ago, when I lived in Britain, I grew shallots, red and brown ones and they were heavenly! Why it has taken me so long to grow them again I don't know. It might have had something to do with space but now I have lots of space there is little excuse. I haven't put these in yet as you can see. 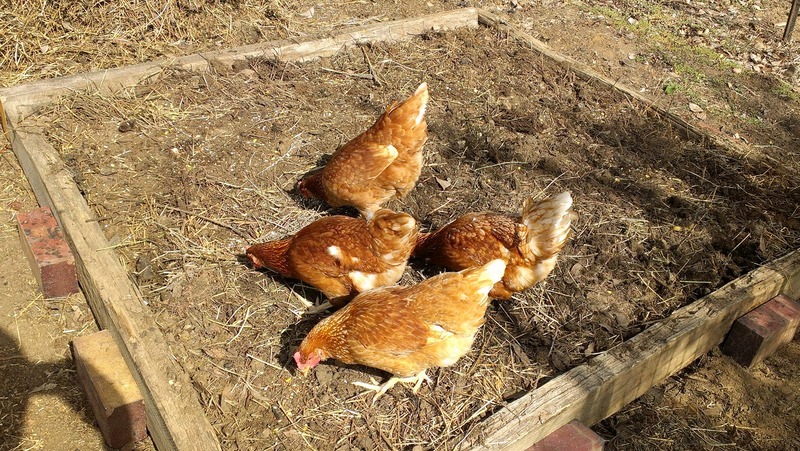 I intend to plant them in a couple of weeks, in the meantime I have prepared a bed for them and am asking the chooky girls to help out. This morning they ate a lot of slaters that were hiding in the parts of the bed that had lots of straw. They have done a fair bit of scratching around already. 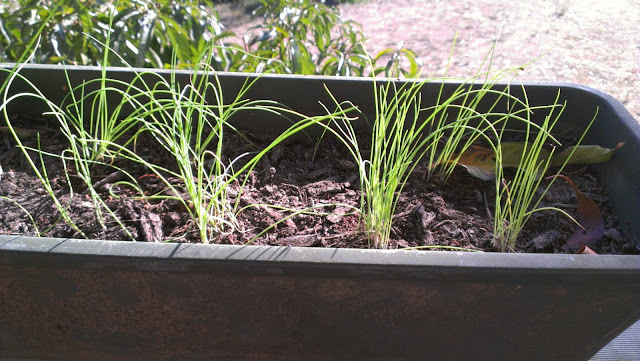 I also have chives and garlic chives in pots but I kind of call these things 'herbs'. Yes, hmmm. You will have noticed that I don't have any onions in. To be honest, I am a little scared of growing onions. Scared is perhaps an exaggeration, I think I don't like the idea of tying up a big area of a bed when I might be unsuccessful. 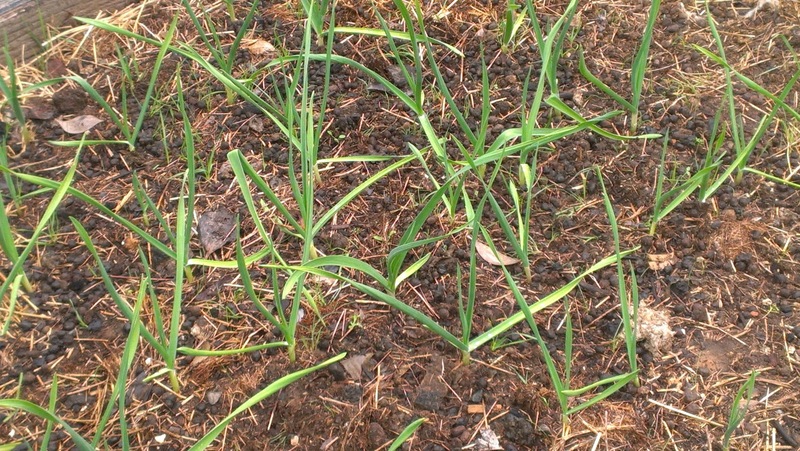 If I think growing garlic is a challenge, I suspect growing onions is even harder. If you have any tips for success with onions (and garlic for that matter), It will be greatly appreciated. Perhaps I will take onions on next year. I'm loving reading about your April garden (with a dash of envy). You are doing amazing stuff. Me? As usual, I haven't done nearly as much as I'd hoped and I'm way behind you (AND everyone else!). I don't have any hints for growing onions and garlic but I grew both last year (and garlic for a few years prior) and I was happy(ish) with the onions but disappointed in the garlic. But then, many complained about how their garlic crops went so maybe it was a bad year. I have one of my raised Birdie beds planted out with onions - white, red and brown. Harvesting and curing them last year gave me a kick so I had to try again (with even more). A friend gave me a bulb of giant garlic and the cloves are waiting for me to plant them this weekend. There are only five cloves for the bulb but they are huge - each larger than a whole bulb of 'normal' garlic. I didn't get around to sourcing more garlic on-line so I'll be scouring the garden centres for a supply. A visitor on the weekend asked if she could have one of the cloves of giant garlic and I had to say, um, sorry, no, there are only five - if they come good, I'll give you some next time. That sounds selfish but she's just as likely to throw it in a pot of spag bol rather than plant it (I know her well)!! I hope your onions go as well this year, you sound like you enjoyed the experience last year. You will have to let me know how you get on. I reckon onions are easier than garlic, or should that read: in my climate I find growing decent size onions is easier than uniformly good garlic. I think Melbourne's winters are a little too mild for garlic to do really really well - or perhaps its either me, the lack of full sun or the varieties I've been growing. I still grow it though because even small cloves are better than imported cloves. My parents grow fabulous garlic and onions. Their climate is about 4 degrees cooler than Melbourne and both do really well there. I reckon you should put a few in and see what happens. Perhaps start a few seeds in a punnet and then if they germinate and start to grow you can slot them in wherever you like? One thing I do find about growing onions is that they take ages to get big. They look really pathetic for most of 8ish months they are in the ground and then suddenly they start to bulb up and look great. OK, that's interesting. If it is down to climate the perhaps my garlic will do ok. It's going to colder than your parents place here I think. Of course it might be more complicated than that. I like your idea of trying some onions as gap fillers, I might give it a go. 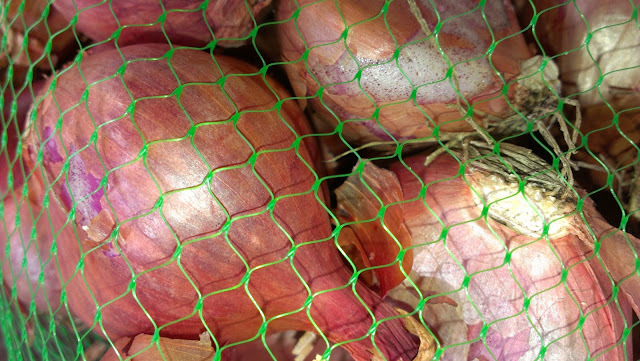 I like growing shallots better than onions - seems like more bang for your buck somehow. You plant one and you get a whole bunch. With onion sets you plant one and you get a bigger one. Tried growing onions from seed but the results were too tragic. We just get too much rain in Wales - that's why the leek is so important here (tolerates the wet well). I loved growing them in Britain. You are right you seem to get such a lot of bulbs per seedbulb. Perhaps I should givemore water to my leeks. I planted my garlic and some onions this morning. Last year I studied the catalogue and tried so many different varieties of garlic. Today I just planted out a whole lot of what I grew last year that had been mixed up in a bucket so I have no idea what it is! Last year we put a few onions in a polystyrene box because we didn't think they'd come to much, and basically forgot about them. They actually did really well. Planting them in the box was good as it didn't take up space in the main beds and they could just sit there for as long as it took (which was quite a while). I hadn't thought of growing shallots before. Are you just planting out individual bulbs like you'd plant garlic? Great inspiration from your casual onion growing, love it. I am buying a punnet or two to try them out. 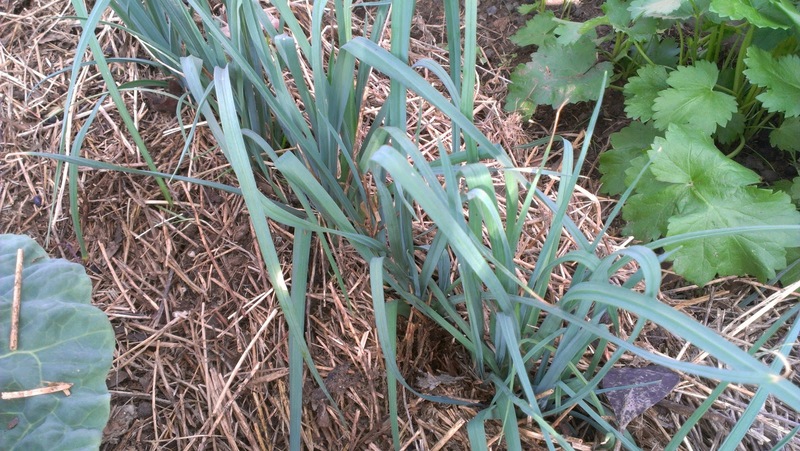 As for shallots, you plant out individual bulbs. I bought them from green harvest. Excellent thanks for the tip, I'll definitely give that a go.